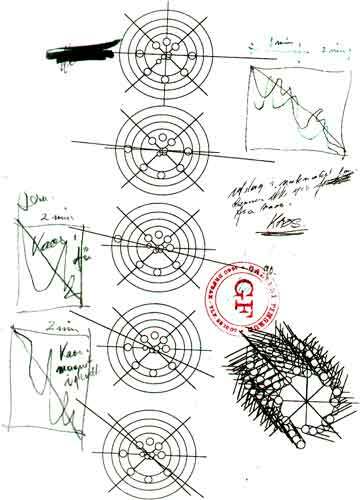 The order of Time free energy research: Reidar Finsrud GMD 'perpetuum mobile' design, Anand Aadhar. He is a painter and a sculptor. One day he wanted to make an ashtray... floating on a magnetic field. It didn't work, he got angry and said: 'Not stable? Then I'll make it move!. that was in 1984. he thought and tried for many years. He studied the magnetic restlessness and what the best arrangement would be. He discovered that adding a normal pendulum, to the chaos pendulum, prolonged its activity. He used three pendulums to control it and made a track, He attached it to the chaos pendulum. Horseshoe magnets fixed to the pendulums were to control the movements of the setup, with on it a steel ball of 0.82 kg, 2,7''. The ball Passed a lever to drive the pendulums, but the unrest ended after a while, the ball stopped on the track. So he placed the setup on a column and created a vibrating connection. It took him many years to figure out the design of the vibratory unit between the ball and the top. This is the final building plan. In 1996 the ball finally kept moving! This newspaper picture was shot when the machine ran for 6 weeks. And so is it running ever since, with some maintenance now and then. Maintenance: 1) cleaning the track. 2) Redo the resin fix of the magnet array in the base. This defines the living universe with Finsrud. Does this finding add up with the existing new physics theories? yes it does! Albert Einstein in a Lecture in 1920 said: "there can be no space, or any part of space without gravitational potentials", he concludes saying: "Recapitulating we may say that according to the general theory of relativity space is endowed with physical qualities, in this sense, therefore, there exists an ether." Hence we may speak of the ether in a relative sense. Ether is according the ancient vedic texts the first material effect of creation: first there is pradhâna, or what Einstein calls timespace: space and time as one expanding force: in our device this is represented by the magnetic repelling force of the array. As we all know is this force in our three dimensional universal space opposed by attraction: a magnet shows this polarization of universal space by its polarity. A modern Aether Physics model of Thomson and Bourassa speaks of a combination of forward and backward time to define the Aether unit. It is associated with our basic particles of matter: neutrons, protons and electrons. In other words. space is a form of energy that can be converted by addressing the aether as a combination of forces, like with the repelling and attracting of a magnet and the 'space pressure' of gravity. Descartes said: "empty space does not exist" and: "all of matter is a transformation of the aether" Thus do the new theories embrace the old ones. Therefore this machine runs. It addresses the time forces of space or the relative ether correctly and transforms that energy into kinetic energy. It is relative, therefore it works! But all of this theory is nonsense if we can't work with this finding by making a machine - or replication -operating on these principles. Till then Finsrud is just an artist and we are in the dark about magnet motors. Science will have to deliver proof by experiment that our belief in this perpetual motion machine was justified or not. Thus we experiment!. Anand Aadhar: "Welcome to my gravito-magnetic experiments. with the IPMM disc. This is version number 6, and this is the loop to address the relative ether. This (middle) stator moves this disc, which pushes up this lever which controls this gravity controlled pendulum which drives again the disc. Thus we have a loop. It is not a self-runner yet, but it is functioning quite stable and maybe I'll succeed some day. I thank you for your attention." Arrived at Oslo (Torp) 123 kilometers from Oslo. Took a taxi to Sandefjord and then on to As via Oslo by train (a four hour trip). Arriving at As there were no taxis at the stand, a phone call resulted in an English speaking taxi driver within ten minutes. Luckily he knew of the Finsrud Gallery and took us there. Arrived at 3.45 p.m. on the Saturday having left London at 4.00 am that morning! The gallery is nicely fitted out giving the impression of a quiet library. It was immediately obvious that it was Reidar Finsrud who was working on a computer at reception. Dressed in white engineers overalls and sporting a pony-tail he remembered me when I said we had spoken a few weeks ago while he was eating lunch! I guess all the things I had said on the phone about the Earth's energy problems, the science that his machine proved wrong had been less important than his lunch! This is no bad thing. Reidar was extremely polite and speaks excellent English, when he realized we had only quarter of an hour before closing he volunteered straight away that he would be around a little longer and that we could stay later. Somewhat of a relief not to have traveled 12 hours for just quarter of an hour viewing. 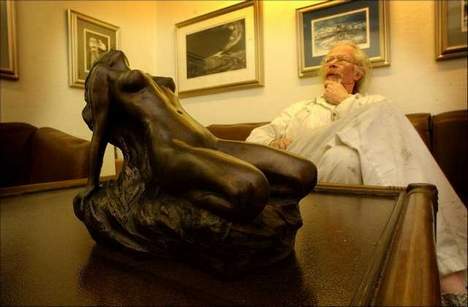 Reidar keeps his 'Perpetuul mobile' in his strongroom in his basement with a couple of other pieces of his highly prized artworks. He happily showed us to this room while talking engagingly about the machine. 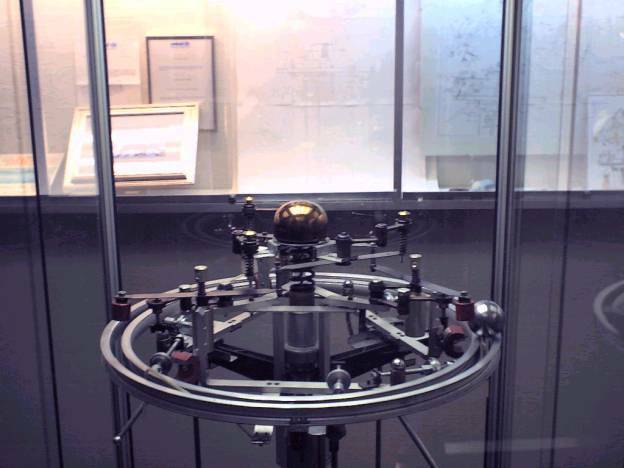 On entering the strongroom the machine is directly in front enclosed in a glass cabinet, it stands about a meter and a half tall, the ball is on a gently moving track and it goes round and does not stop, there are no motors. A ball would normally only go around a few circuits but this does not, additional energy is coming from somewhere and the scientific understanding of physics falls flat on its face with each circuit of the ball. The machine is well built, there are no ends of bolts sticking out and Allen key style nuts are used in most places. There are no apparent rough edges or bits that are broken. It is not perfect however, as the ball rolls around there are two places roughly opposite where track noise can be heard and the ball audibly vibrates; that said, it is really quite smooth. The ball does make a noise as it goes around, this is just like a ball bearing on a track, like a roulette ball. I also noticed what appears to be a putty of some kind in just a couple of places, I think this has been used to balance the machine, finger prints clearly mark the putty. Let me describe the movement in the machine, the most obvious yet least important movement of the machine is in the three regulatory pendulums, these are pivoted by a right angle of metal used as a hook to each of three arms coming from the main internal pendulum that goes down the central column of the machine. The swing of the regulatory pendulum is always at the same place with respect to the ball going around the track (two bicycle wheel rims). The regulatory pendulum swings in the opposite direction to the ball as the ball approaches. On the top of the pendulum, above the pivot is a horseshoe magnet, this is attracted to the ball as it approaches. As the ball passes the horseshoe magnet the magnet is closest to the ball and at its lowest point, the pendulum below the pivot is therefore at the furthest point of its swing away from the ball. This is the position each time the ball passes. I should also point out that this is a normal not chaotic pendulum. These pendulums are attached to the arms of the central internal pendulum. The track is fixed rigidly to the arms and the arms are fixed rigidly to the central pendulum. This central pendulum has a circular movement which is therefore passed on to the track. It is the circular movement of the track which moves the ball. (If you were to put a marble on a dinner plate and make a circular movement it also would go around. The track does not rotate, the high point on the track moves around in a wavelike fashion so the ball is always on a slope.) It is this part that gives the machine its movement but it is the top part, the 'vibrationary assembly' which powers the central pendulum and therefore it is this part where the extra energy is coming from. The machine is supported by a central column within which the central pendulum swings in its circular motion. The central column is secured at the bottom by a large copper flange to ensure the machine does not topple over. This central column rises to just before the arms to the track start. At this point, three aluminum bars are attached which pass through the track arms and support the machine by attaching to a triangular arrangement of metal lengths upon which the machine is eventually hung. Separating these metal lengths and the central pendulum is a whole system of vibrating springs and further metal lengths, power is generated here. This system is designed so it is always reverberating, as an input from one area dies down so another input starts, this part of the system is designed to never allow stability and so causes the perpetual motion. The area where vibration is most clear is the input to the system from the ball itself. There are three round magnets on the end of metal lengths positioned in a triangle so that they are just over the ball as it passes them on its journey around the track. (There are small metal spikes below the metal lengths near to the magnet, these stop the magnet from getting too close to the ball and are probably only of use during the machine start up.) The lengths are like metal rulers, like the ruler a vibration can be set up in them. This happens when the ball comes around under the magnet, pulling it towards the ball, once the ball passes it the attraction on the magnet is released and a vibration imparted on the metal length. The lengths are balanced in the middle, supported from below also with a spring assembly above them, I believe this is to enable the strip to be supported but not to dampen the vibration. At the opposite end to the magnet the metal length feeds the vibration up to a smaller triangular array of metal lengths. The attachment is by a medium weighted bolt, I believe the weight helps conserve vibration. This further triangle of lengths is about five centimeters above the middle triangle; they are attached at their center points to the suspension point of the central pendulum. The other end of the lengths on the higher triangle is balanced with a knuckle shaped sprung bracket assembly. I don't know if the function is just a balance to the weight on the other end but it appears to also help with the vibration. At the center of the metal lengths of the higher triangle is the attachment to the pendulum. The central pendulum is hung off a copper bowl, this only contains the attachment. 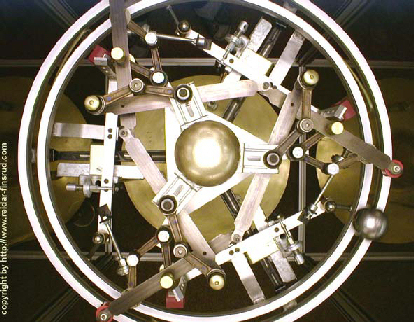 The heavy 40kg pendulum swings in a circular motion in the central column. Further support for the weight is via a spring which is supported by the central column. The design of the vibrating assembly is interesting when viewed from above, the lower triangle supporting the assembly is the smallest, its points would touch the mid points of the highest triangle, the higher triangle's points would touch the mid points of the middle triangle formed between the three magnets overhanging the track. So what makes this machine run. I don't think I am able to answer this, the vibration assembly certainly keeps movement going longer than otherwise but I keep coming back to the movement of the central pendulum. There is a subtlety and pureness to the movement that has a logic to it, I can only describe this as being like Pythagoras theory, when the solution is presented there is a naturalness which does not require a proof, it simply 'feels right'. Reidar says the machine does stop on occasions but that this is not on a daily basis. To start the machine the pendulums are swung by hand, this puts an external input energy into the system, given that the machine does stop this means it is not over 100% efficient. 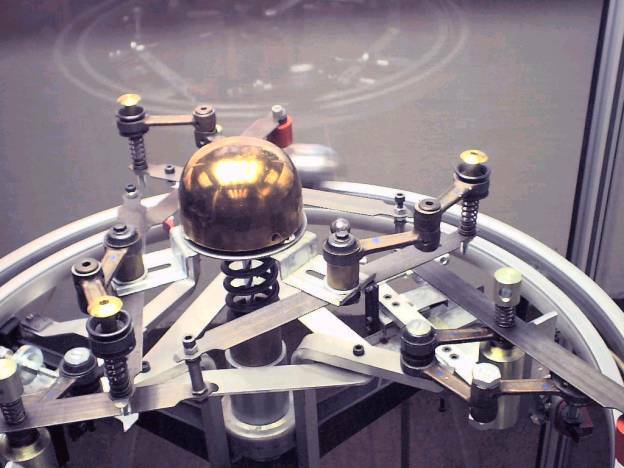 Without any motion in the pendulums the ball would travel only twice around the circuit, with only the regulatory pendulums it would go around about fifteen times (due to the external energy created by swinging the pendulums by hand) but the ball soon stops as pendulums themselves do not continue for long. Unlike a clock there is no spring mechanism to increase the time they swing. With the central pendulum moving and the triangular arrangement working together it goes on for days at least. Clearly the forces of friction, air resistance and gravity which should stop the machine are to an extent being overcome by the introduction of additional energy into the system. In trying to arrive at ball park figures I will assume it is unlikely for any mechanical device to be more than 90% efficient, the 'Perpetuum mobile' at 99.999% (estimate) efficiency is therefore receiving about 10% of its energy from unknown sources. My personal view is that the machine remains 90% efficient, but has an additional energy input, the total of which is zero but is in fact an extra 10% positive energy and a 10% negative energy. The 10% negative energy should show up as a reduction in air temperature around the machine of a reduction in the machine weight. I did not measure the temperature of the air near the machine or weight stopped and then moving (the later being somewhat impractical). I asked about the rough areas of the track where the ball can be heard to 'rattle', apparently oil has been tried and it stops the machine like treacle because it increases the touching surfaces between ball and track. When parts other than the track are oiled a very thin oil like clock oil is used. When a start up is required this takes about 15 minutes, this is due to the difficulty involved in getting all the parts moving in harmony. The unit is based on the chaos pendulum though the machine does not actually use these at any point. 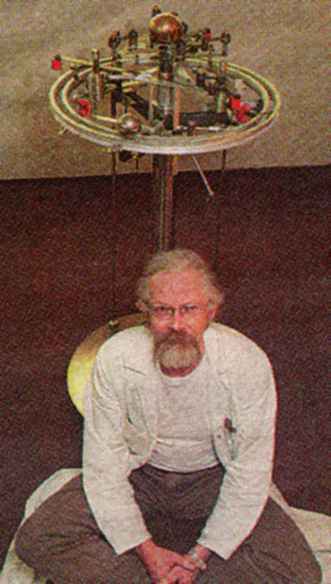 Reidar first became interested in the chaos pendulum. This is simply a metal or magnetic pendulum, typically on a long piece of string (at least a meter), a little distance below the pendulum is a random array of magnets (if using a magnetic pendulum it is probably best to make the magnets in opposition). What happens when the pendulum is swung over the magnets is that it will first become attracted/repelled to one then another magnet. The movement is not entirely random but the pendulum takes an erratic path eventually becoming static in a position that is not vertical. This represents a potential energy in the pendulum. 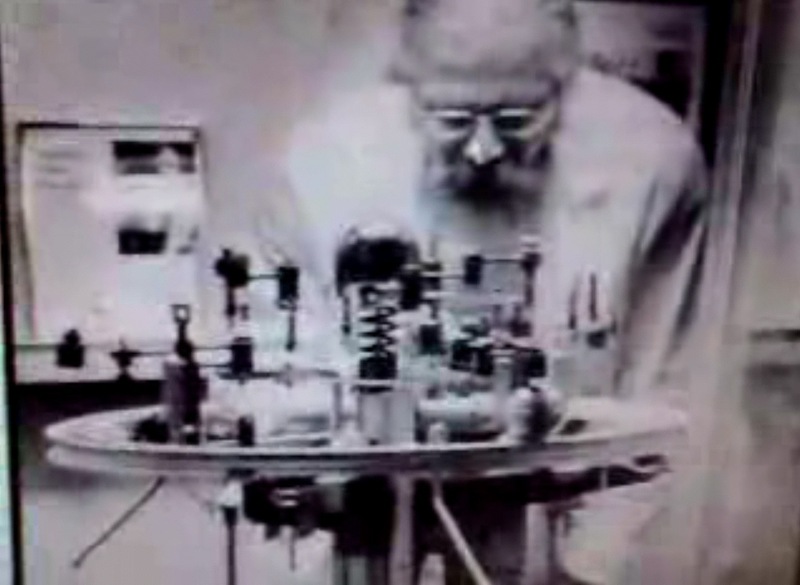 Reidar timed the length of swing of a normal pendulum, then a chaos pendulum, the times were similar but Reidar noted that the chaos pendulum still kept some potential energy. In order to release this energy he hung further chaos pendulums near the first, he attached the pendulums together using a length of line. Now, when the pendulums came near rest it would occasionally be pulled by another pendulum and release that potential and start to move again. When timed this system of chaos pendulums was found to take longer than just one chaos pendulum before it came to rest. Many different combinations of pendulum numbers and types were tried, eventually the idea of continuing vibration being used to keep the system in motion became the vibrationary unit at the top of the machine. The triangular array was finally achieved after many tried and failed attempts to get this part to continue indefinitely. This unit is the powerhouse for the machine, without which it does not work. Reidar has many things to occupy his time, his gallery is on three floors and he is setting up another larger gallery in another location. He teaches and has 120 students, his subjects are the human body as a science as well as art. Additionally he has commitments to lecture on other subjects (usually the machine), this work allows him freedom to pursue his other interests. His gallery is full of his own work, observations of subtleties of human nature and form as well as woodland scenes. Animals are entirely missing from his art and this surprised me. Reidar has deeply held convictions on greed. He feels the economic system that we have fuels greed to encourage people to get things others don't have. We tend to go along with this and by doing so simply line the pockets of the heads of corporations. The paradox is that if they lived their lives in balance they wouldn't need the money and wouldn't encourage people to buy so many material goods which they don't need either. We don't need wardrobes full of clothes nor more than one car. We don't need to keep changing the goods in our houses or our car, what people should realize is that if it works it doesn't need changing. Unfortunately while the economic system fuels itself in one way it does not in others, it needs to take from the environment all the time, however the environment only has so much that can be taken. Reidar questions why a fast motorbike doesn't come with a health warning while cigarettes do. It comes down to profits again, because manufacturers are not forced to put on health warnings they don't, yes people know these things are dangerous but manufacturers would rather not encourage us to think about these dangers, they really want us to buy, it helps their bottom line. Things such as branding and other methods of product differentiation just cause duplication of very similar products. This is inefficient but helps the bottom line in more companies so it is done. To save energy, houses in cold areas could be built underground. Reidar does not need to heat his basement although there was snow outside, perhaps more people could do this (he didn't talk too much about his top two floors though!). Reidar does not believe an over unity machine is required to solve our energy crisis just a change of attitude among people. He has a vision of people becoming less materialistic, the greed based competitive economic system sinking and people working together 'like ants'. Reidar is collaborating with an industrial company to try and produce a machine based on his perpetual mobile but which produces an excess of energy, this is ongoing. He is also making other energy producing devices using solar power and wave power. To demonstrate solar power he has made a six foot diameter solar windmill (like the ones that come in a slight vacuum in glass shaped like a light bulb). This works by having black and reflective silver areas, the black areas are heated by the sun warming and so expanding the air behind it held in a chamber, the expanding air is forced out through a hole causing the windmill to turn. I hope I have done justice to Reidar Finsruds ideas and his machine, I would encourage people to visit his gallery if not too far away, you may well enjoy visiting Norway into the bargain. I shall not be attempting to replicate this machine. 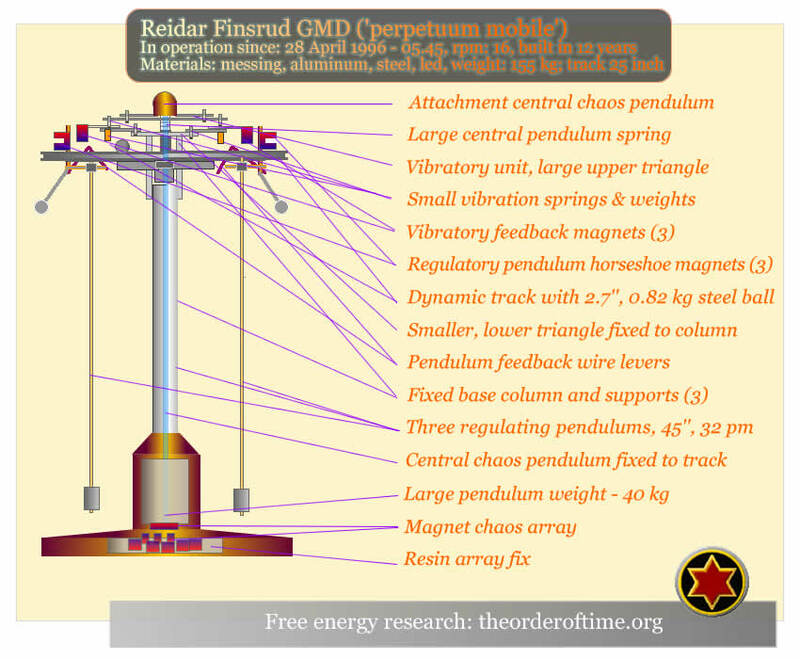 It is clear to me that the central pendulum could be supported by an oscillator at the bottom, that the track could be kept in place by magnets in opposition to magnets on an external ring and that units like this could be stacked three high and that the vibrationary unit could be replaced by destabilization magnets. Additionally an energy collector in the form of aluminum cones and a steel shell should be used. I guess you see what that leaves me with! The sign reads 'Perpetuum mobile - Reidar Finsrud 1994'. This is seven years ago and it has not been successfully replicated, this is appalling, everyone should have one of these in their house, their schools and museums. If our time is running out on Earth I can imagine a fitting epitaph for humanity - 'Could have done better'. This mustn't happen, keep up the good work. Studio is open 12 - 5 on a weekday and 12 - 4 on Saturday. Closed on Sunday. - An Italian study of Finsrud.